Collins Booksellers - Karate Science by J. D. Swanson, PHD, 9781594394607. Buy this book online. Dynamics, motion, and sensation are karate’s connective tissue—and they are the heart of this book. As a lifelong student of martial arts, J. D. Swanson, PhD, had searched through piles of books on form and function. Stand here, they said. Step there. But where movement was concerned, not one of them went deep enough. No one discussed dynamics—the actual feeling of the moves. Martial instruction, both in print and in person, tends to focus on stances and finishing positions. But dynamics, motion, sensation . . . they are karate’s connective tissue—and they are the heart of this book. 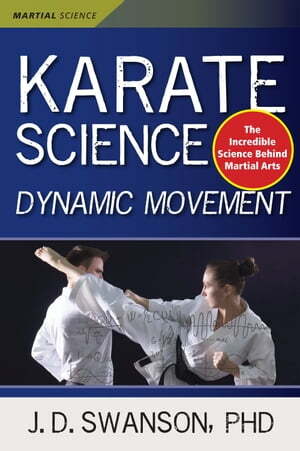 Karate Science: Dynamic Movement will help you understand the mechanics of the human body. Swanson describes these principles in incredible detail, drawing on examples from several styles of karate, as well as aikido, taekwondo, and judo. Whatever your martial background, applying this knowledge will make your techniques better, stronger, and faster. • Understand the major types of techniques, including their outward appearances and internal feelings. • Master the core principles behind these feelings. • Learn the biomechanics and dynamics of core movement. Karate Science: Dynamic Movement is filled with examples, anecdotes, and beautiful illustrations. Although Shotokan karate is the author’s frame of reference, the principles of human mechanics translate to all martial styles. • Clear and insightful explanations of dynamic movement. • Profound but accessible analysis of the kihon, or fundamentals of Shotokan karate.